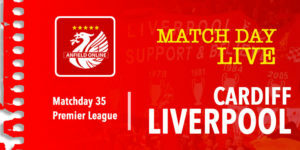 Liverpool travel to Old Trafford with the aim to leapfrog Man United in to second place in the Premier League and bolster qualification for next season's Champions League. The reds will also be hoping to end a spell of four consecutive draws against United - the last three in the Premier League. The last decisive result between the sides was when Liverpool beat United 2-0 at Anfield in the Europa League Last 16 1st leg in 2015/16. Liverpool's last victory at Old Trafford was in 2014. For Liverpool Andy Robertson and Gini Wijnaldum could both be back in contention while United could call upon the services of Marouanne Fellaini. This is the 170th meeting between English football's two biggest clubs - Man United have the better record in the historical head to head games with 67 wins compared to our 55. Clearly a win for Man United, with a further 8 games to play would give them the upper hand in terms of finishing second in the Premier League. It could also allow Spurs to overtake Liverpool when they play tomorrow away at Bournemouth. Pre match rumours suggest Paul Pogba won't be playing for Man United after picking up an injury in training yesterday. We will find out imminently. 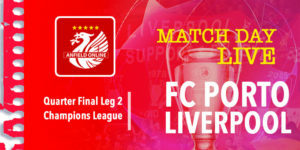 Liverpool team: Karius, Alexander-Arnold, Lovren, Van Dijk, Robertson, Milner, Can, Oxlade-Chamberlain, Mane, Salah, Firmino. Substitutes: Mignolet, Wijnaldum, Gomez, Henderson, Lallana, Solanke, Matip. Club captain Jordan Henderson then not one of the preferred midfield three, and on the bench returns Gini Wijnaldum after a layoff due to illness. The pre-match rumours concerning the United midfielder were true. Man Utd: de Gea, Valencia, Smalling, Bailly, Young, McTominay, Matic, Mata, Rashford, Lukaku, Sanchez. "Liverpool are a very good team, with some weaknesses. They're not a perfect team, but they're a very good team. "That's why they are where they are. I know my team's weaknesses. Sometimes I hide them, sometimes I compensate for them. But Liverpool is Liverpool, and we are what we are." Reminder that Liverpool's Premier League record at Old Trafford has not been sparkling. Man Utd have won 15 of our PL clashes at home while the reds have won just the 5 here. We're underway at Old Trafford! Oxlade-Chamberlain being man-marked in midfield by Matic. 4' Liverpool have started brightly. Lots of possession. Man Utd more than happy to let LFC have the ball so far with no real pressure being applied. 5' Free kick to United in their half. Bit harsh on Emre Can there who clearly won the ball v Valencia. Dejan Lovren has seen plenty of the ball so far - most usually leathering his foot through the ball to prevent any potential incidents. 10' No shots on target so far. Liverpool with most of the ball, Man United very cagey - midfield and defence for them sandwiched tightly together. He gets past Alexander-Arnold and then twists him again before firing in right footed. 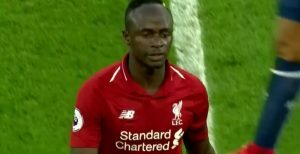 18' Firmino cross, de Gea beaten but so was the head of Sadio Mane. 19' Lovren being consistently outjumped by Romelu Lukaku which is an increasing problem here for Liverpool. 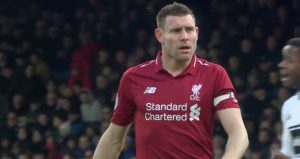 23' Cross by Milner, and van Dijk heads that wide - not under much pressure either. Should have done much better. Van Dijk's header actually came off his shoulder, might have been nudged by Matic. Oh dear. It's 2-0 to United. Long kick by de Gea. Lovren outjumped by Lukaku and Rashford managed to pick up the ball - it takes a deflection off Alexander-Arnold and it's a 2-0 lead. 27' Marcus Rashford has a yellow card to go with his two goals after a foul on James Milner. 36' Some frustration, Alex Oxlade-Chamberlain goes into the referees book for a foul on Scott McTominay. Good cross in from Robertson, but Ashley Young is there to clear the danger. Approaching half time. United 2-0 up. 2 minutes added time at the end of this first half. Disappointing half from Liverpool who were beaten by a couple of defensive errors really - not strong enough with the headers. Lukaku with the strength and Rashford with the finishes. 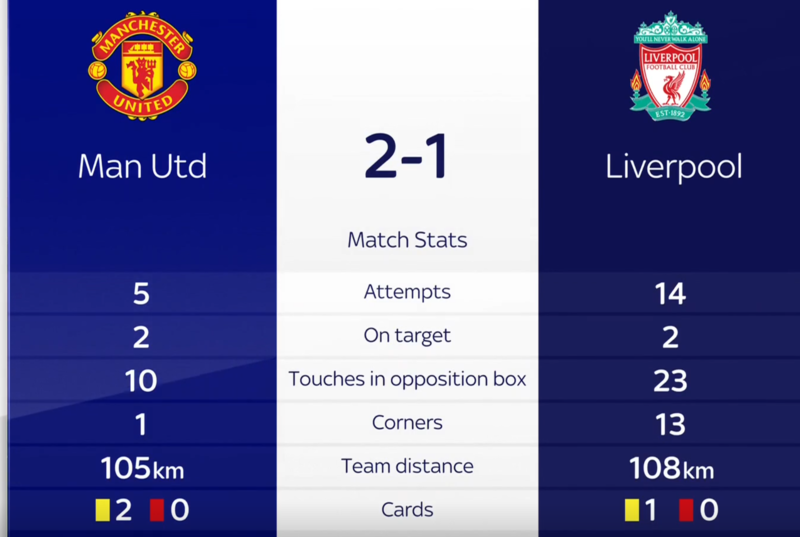 United have defended well and Liverpool haven't had much of a sniff up front. We're back underway. No changes. 48' Liverpool corner. And van Dijk heads it on to the roof of the net after outjumping Chris Smalling. Ashley Young has his hands around Mo Salah and the Egyptian can't control the ball in the penalty area. 52' Lovren catches McTominay in the back of the head. Liverpool in possession. From resultant drop ball Ashley Young launches it back towards Liverpool's defence. 55' Strong appeal for a handball in the area - Andy Robertson's cross was stopped by Valencia's hand. Liverpool enjoying a good spell of possession. 59' Chris Smalling throws Mo Salah to the ground. Overly aggressive and goes unpunished. 61' Adam Lallana is on for Alex Oxlade-Chamberlain, who looks disappointed that it hasn't quite worked today. 63' James Milner tries an ambitious sliced shot from outside the area. Liverpool with most of the ball but just not managing to get close enough to hurt United. Liverpool need a goal soon here. 66' Sadio Mane crosses the ball and Eric Bailly puts the ball, rather bizarrely, in his own goal. Should be about 25 minutes left now then. Bailly looked like he was going to go off injured for Fellaini, but the own goal scorer is back on. 69' Double goalscorer Rashford off and Fellaini on. 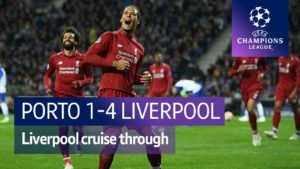 Liverpool have been by far the better side in this second half and look a lot fitter than the Man Utd players, who will have a crucial Champions League clash in a few days. Wijanldum about to come on. 79' Alexander-Arnold goes off and on comes Wijnaldum. An incident just before that were Lovren put in too dismal challenges on Fellaini. Klopp a bit angry under the collar and Craig Pawson comes over to talk to the Liverpool boss. Mane and Fellaini going for the same ball in the area but Fellaini appears to catch the back of Mane's ankle and he goes down. Liverpool have had three shouts for a penalty in this game. 83' Klopp going for it. He's already taken off one full back - now off goes the other. Robertson makes way for Dominic Solanke. 88' Jesse Lingard on for Juan Mata. Not long left now. Subs have a lot of the sting out of this second half. 89' Valencia gets booked for a foul on Mane. Cynical foul. And Wijnaldum's effort is put wide for a corner. De Gea clears from the corner. 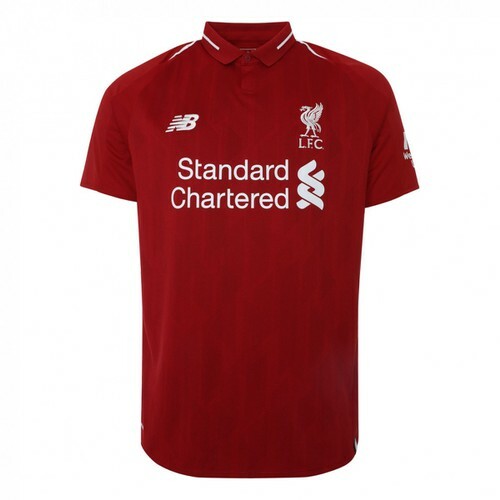 95' Late Liverpool corner. Should Karius go up? No says Klopp. It's a break from Man Utd and Karius is out to slide and clear the ball. Karius furious that he's not allowed to come up for this corner. 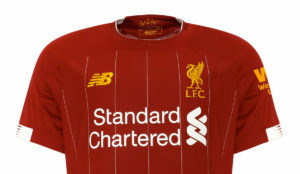 .. ball drops to Salah and he fires over the crossbar. A late sub for United and then that's it. Full time. Man United hang on. It was all Liverpool second half but we'd made two mistakes in the first half. Klopp and Mourinho shake hands and United now have a 5 point cushion in second place.